Total joint replacement surgery is a common and generally successful procedure, with nearly 7 million people in the United States living with a hip or knee replacement.1 However, prosthetic failures occur in approximately 1-2% of arthroplasty cases, and can be associated with damage to periprosthetic tissues and inflammation.2 Similarly, material from bone grafts and synthetic bone graft substitutes can result in histological abnormalities that pathologists either may not recognize or may misinterpret as necrotic lesion tissue. In both cases, recognition of characteristic histological reactions caused by implant failures can help guide clinical diagnosis and treatment, provide information for improved device manufacture, and maintain compliance with federal reporting policies. There are many potential mechanisms of arthroplasty failure, but those of most interest to pathologists include: insufficient osseointegration, osteolysis, periprosthetic joint infection (PJI), aseptic lymphocyte dominant vasculitis-associated lesion (ALVAL), and pseudotumors. Figure 1: Tissue around a failed, metal-polyethylene hip prosthesis. The “granular” appearance of the macrophages is caused by countless sub-micron particles of polyethylene. Small particles of metal, bone cement, and contrast media along with hemosiderin are also common. If an implanted device does not adequately bond with the bone, then micromotion may induce a fibrous membrane or granulation tissue. Imaging reveals a linear radiolucency around the implant, and histology of the peri-implant tissue shows a fibrous membrane with no neutrophils and relatively few macrophages. Particles of wear debris, giant cells, lymphocytes, and plasma cells are also rare. Figure 2: Numerous neutrophils (polymorphonuclear leukocytes, PMNs) are present near the surface of this implant membrane. Whether or not accompanied by particles, this histologic appearance strongly suggests a periprosthetic infection. Infection around the joint implant, or periprosthetic joint infection (PJI), is one of the most common and serious complications of total joint replacement, and it can result in considerable healthcare costs and patient distress. Diagnostic guidelines from the American Academy of Orthopedic Surgeons (AAOS) recommend intraoperative consultations (frozen sections) in cases where periprosthetic infection has been neither diagnosed nor excluded. The AAOS found adequate literature to support two different thresholds for diagnosing infection: (1) a maximum tissue concentration of 5 neutrophils in each of five, ×400 high power fields (hpf), or (2) 10 neutrophils in each of 5 hpf.7 Cleveland Clinic looks for a more sensitive reading of at least 5 neutrophils in each of 3 hpf. 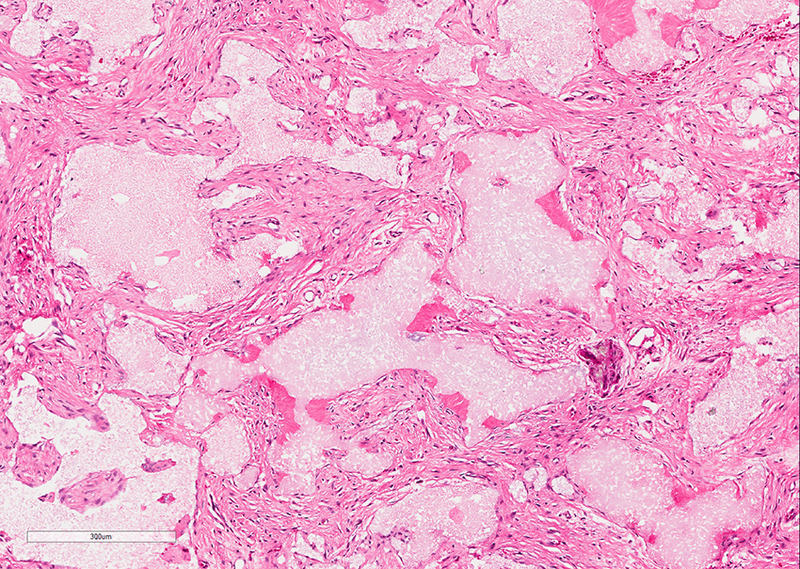 Figure 3: This tissue was adjacent to a failed metal-on-metal hip arthroplasty and shows features typical of aseptic lymphocyte-dominant vasculitis associated lesion (ALVAL). Although not a true vasculitis, it has a laminated appearance with a hyalinized surface and deeper diffuse and perivascular chronic inflammation. An unusual pattern of inflammation associated with failures of metal-on-metal implants and devices with corrosion at modular interfaces has been termed “aseptic lymphocyte dominant vasculitis-associated lesion” (ALVAL), and consists of a laminated fibrous membrane with superficial necrosis, a hyalinized layer of collagen just beneath the surface, and deeper perivascular and diffusely distributed chronic inflammation (Figure 3).11,12 Particles in macrophages may have a green, grey-green, or brown appearance. Despite its name, ALVAL is not a true vasculitis; the inflammation is thought by many investigators to reflect an immune reaction to metal particles or ions. Solid or cystic mass lesions around the hip may be observed with failed metal-on-metal implants or devices with corrosion at modular junctions.13-17 Sometimes referred to as “pseudotumors,” such lesions may be associated with inflammation similar to ALVAL. Additional studies are needed to establish more rigorous criteria for this designation as well as the mechanism causing the lesions. Bone grafts used to replace bone tissue around sites of previously failed implants, fracture repair, or other orthopedic procedures employ a variety of materials that may not be recognized if observed in tissue sampled during subsequent operations. 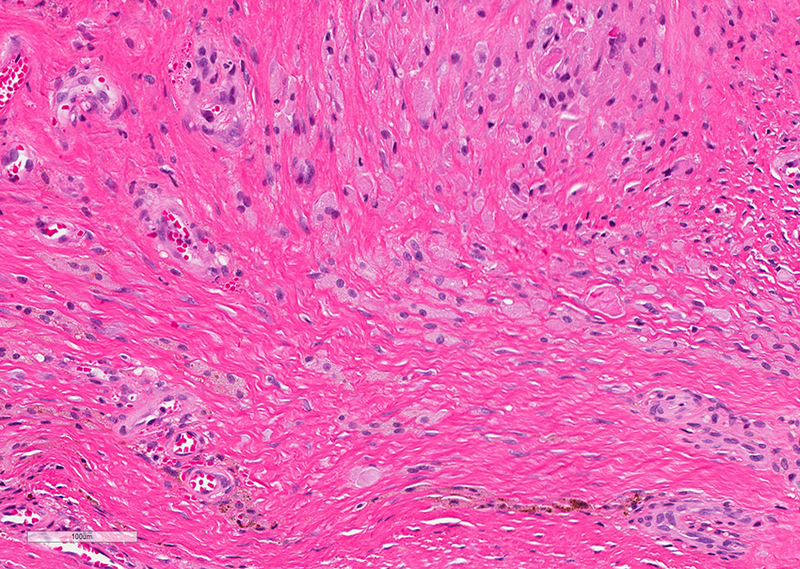 Autograft and allograft preparations can consist of bone fragments, bone marrow, stem cells, or connective tissue precursors, all of which can be misinterpreted as necrotic host tissue. Tissue that appears necrotic at the site of a previous orthopedic operation may in fact be bone fragments from bone graft used in the previous operation. 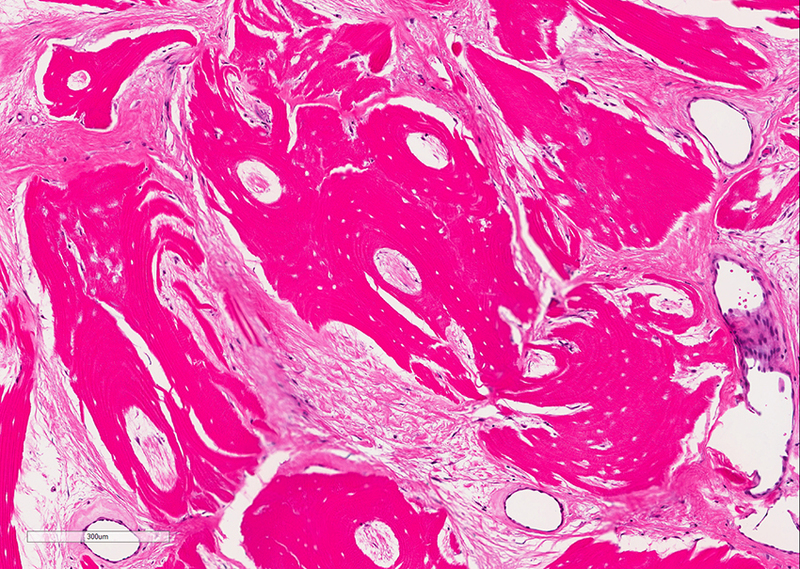 Commercially produced demineralized bone matrix (DBM) is used to induce bone formation, and in histology sections it can be recognized as shavings of cortical bone with empty osteocyte lacunae (Figure 4), sometimes associated with endochondral or intramembranous bone formation. 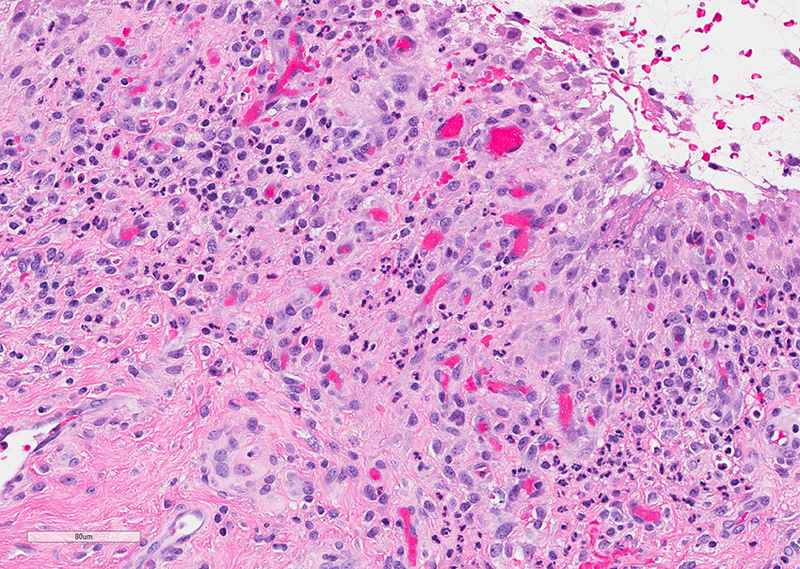 Figure 4: This biopsy is from the site of a previously treated non-union contains shavings of necrotic bone surrounded by fibrous tissue. This is not necrotic host bone, but instead represents a commercially processed, demineralized allograft bone product. It is sometimes associated with endochondral or intramembranous new bone. Compounds containing calcium and phosphate or sulphate used in bone graft substitutes may dissolve in specimen processing if subjected to decalcification, leaving observable voids in the section (Figure 5).18 The rate at which the compounds dissolve depends on their composition, with calcium sulphates generally dissolving faster than calcium phosphates. Bone graft materials should not induce acute inflammation, so a high concentration of neutrophils associated with a bone graft material suggests the possibility of infection. Figure 5: This is a biopsy from a mandibular bone defect that had previously been treated with a synthetic bone graft substitute composed of hydroxyapatite (HA). The HA dissolved during tissue processing, leaving spaces occupied by acellular protein. Small foci of bone formation can be seen around the periphery of some of the HA granules. 1. Maradit Kremers H, Larson DR, Crowson CS, et al. Prevalence of Total Hip and Knee Replacement in the United States. J Bone Joint Surg Am. 2015;97(17):1386-1397. 2. Katz JN, Wright EA, Wright J, et al. Twelve-year risk of revision after primary total hip replacement in the U.S. Medicare population. J Bone Joint Surg Am. 2012;94(20):1825-1832. 3. Hirakawa K, Bauer TW, Stulberg BN, Wilde AH. Comparison and quantitation of wear debris of failed total hip and total knee arthroplasty. J Biomed Mater Res. 1996;31(2):257-263. 4. Hirakawa K, Bauer TW, Stulberg BN, Wilde AH, Borden LS. Characterization of debris adjacent to failed knee implants of 3 different designs. Clin Orthop Relat Res. 1996(331):151-158. 5. Bauer TW, Saltarelli M, McMahon JT, Wilde AH. Regional dissemination of wear debris from a total knee prosthesis. A case report. J Bone Joint Surg Am. 1993;75(1):106-111. 6. Urban RM, Jacobs JJ, Tomlinson MJ, Gavrilovic J, Black J, Peoc’h M. Dissemination of wear particles to the liver, spleen, and abdominal lymph nodes of patients with hip or knee replacement. J Bone Joint Surg Am. 2000;82(4):457-476. 7. Della Valle C, Parvizi J, Bauer TW, et al. Diagnosis of periprosthetic joint infections of the hip and knee. J Am Acad Orthop Surg. 2010;18(12):760-770. 8. Bauer TW, Parvizi J, Kobayashi N, Krebs V. Diagnosis of periprosthetic infection. J Bone Joint Surg Am. 2006;88(4):869-882. 9. 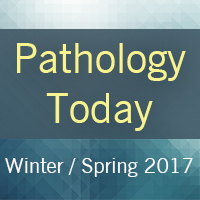 Bauer TW, Hayashi R. The Role of the Pathologist in Diagnosing Periprosthetic Infection. Surg Pathol Clin. 2012;5(1):67-77. 10. Grosso MJ, Frangiamore SJ, Ricchetti ET, Bauer TW, Iannotti JP. Sensitivity of frozen section histology for identifying Propionibacterium acnes infections in revision shoulder arthroplasty. J Bone Joint Surg Am. 2014;96(6):442-447. 11. Davies AP, Willert HG, Campbell PA, Learmonth ID, Case CP. An unusual lymphocytic perivascular infiltration in tissues around contemporary metal-on-metal joint replacements. J Bone Joint Surg Am. 2005;87(1):18-27. 12. Willert HG, Buchhorn GH, Fayyazi A, et al. Metal-on-metal bearings and hypersensitivity in patients with artificial hip joints. A clinical and histomorphological study. J Bone Joint Surg Am. 2005;87(1):28-36. 13. Campbell P, Ebramzadeh E, Nelson S, Takamura K, De Smet K, Amstutz HC. 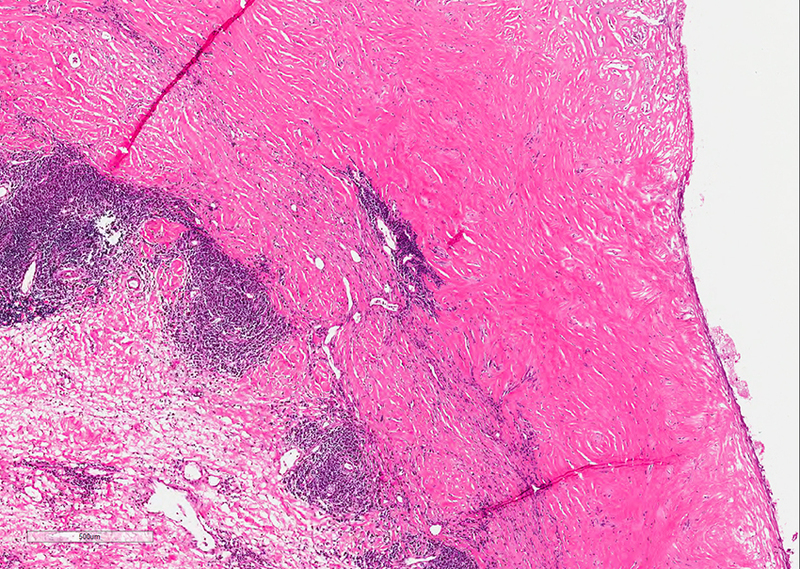 Histological features of pseudotumor-like tissues from metal-on-metal hips. Clin Orthop Relat Res. 2010;468(9):2321-2327. 14. Almousa SA, Greidanus NV, Masri BA, Duncan CP, Garbuz DS. The natural history of inflammatory pseudotumors in asymptomatic patients after metal-on-metal hip arthroplasty. Clin Orthop Relat Res. 2013;471(12):3814-3821. 15. Glyn-Jones S, Pandit H, Kwon YM, Doll H, Gill HS, Murray DW. Risk factors for inflammatory pseudotumour formation following hip resurfacing. J Bone Joint Surg Br. 2009;91(12):1566-1574. 16. Hart AJ, Satchithananda K, Liddle AD, et al. Pseudotumors in association with well-functioning metal-on-metal hip prostheses: a case-control study using three-dimensional computed tomography and magnetic resonance imaging. J Bone Joint Surg Am. 2012;94(4):317-325. 17. Pandit H, Glyn-Jones S, McLardy-Smith P, et al. Pseudotumours associated with metal-on-metal hip resurfacings. J Bone Joint Surg Br. 2008;90(7):847-851. 18. Bauer TW. An overview of the histology of skeletal substitute materials. Arch Pathol Lab Med. 2007;131(2):217-224. Dr. Bauer specializes in orthopaedic pathology, especially biomaterials, and in that context has published more than 245 peer-reviewed publications and 32 book chapters. 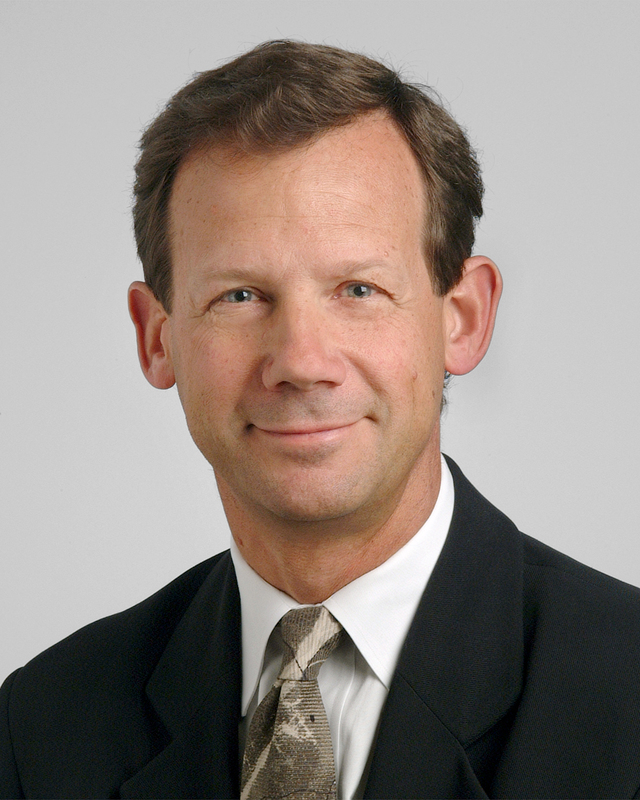 He is the deputy editor for research for the Journal of Bone and Joint Surgery, is the co-editor-in-chief of JBJS Case Connector, has been a consultant to orthopaedic device manufacturers, and is a frequent speaker at orthopaedic and biomedical engineering meetings. In his spare time during the last 10 years, he has completed more than 40 marathon races, five 50K races, six 50-mile and nine 100-mile ultramarathons.